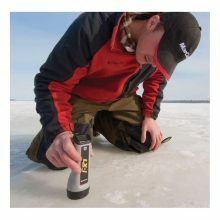 The ultimate portable sonar, LX-i is the size of a flashlight, allowing for easy, one-handed depth and fish finding on ice. 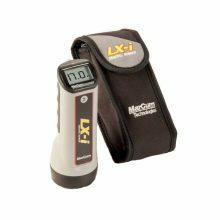 No fumbling with separate transducers— just press the face of the LX-i against wet ice, and digital depth immediately appears on the large LCD display. Powered by a 6-volt battery (included), LX-i comes nicely protected inside a padded carrying case. 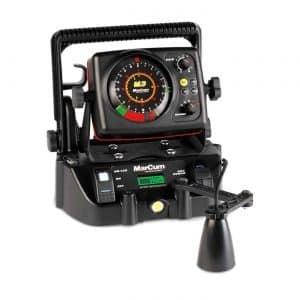 The most advanced flasher-sonars ever built, the MarCum® “M” Series offers brushless, dead-quiet operation with dazzling bright and crisp color definition of bottom, fish, baitfish and your lure, all illuminated on the highest resolution display available in a commercial grade flasher. 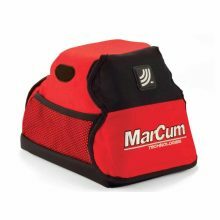 MarCum calls it “Total System Performance.” While it proudly delivers the highest output power in its class, it intelligently manages this wattage to work in concert with the precision tuned transducers and operating systems. 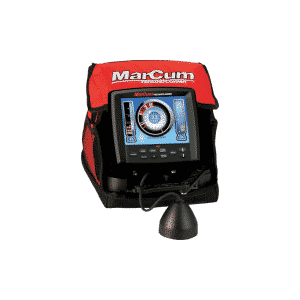 CUTTING EDGE MARCUM TECHNOLOGY IN A COMPACT, POCKET-SIZED UW VIEWING SYSTEM. The power of an underwater viewing system in your pocket. 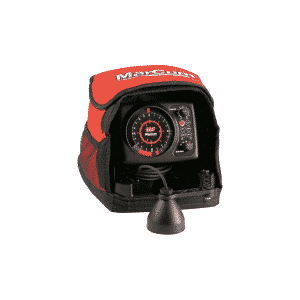 Small in size, but big with features, the Recon 5+ is packed with all the technology that keep MarCum® electronics the angler’s first choice. 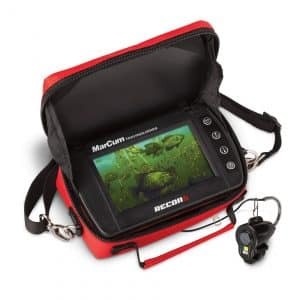 Lithium battery-powered underwater viewing system complete with a powerful camera and a screen about the size of a smartphone with up to six hours of continuous run-time. The underwater camera features a 1/3” CMOS sensor, darkwater LED or infrared lighting, a 110-degree field of view and a 50-foot cord. The camera offers three angle settings: straight down, horizontal and looking up. 5-inch flat panel, high-resolution color LCD monitor displays in a 16:9 aspect ratio. Recon 5’s on-screen display (OSD) shows battery status. Color-kill technology aids anglers fishing in stained water or in low light. In these conditions, switching from a color picture to black-and-white provides an amazingly crisp and clear image. The Recon 5+ features a built-in DVR and the ability to take a screenshot, record to an external Micro-SD Card (up to 32GB), play back video and delete footage, a charger cable, soft pack and camera sack and one-year warranty. 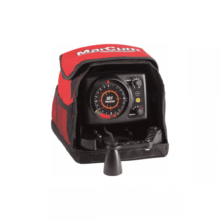 The most advanced flasher-sonars ever built, the MarCum® “M” Series offers brushless, dead-quiet operation with dazzling bright and crisp color definition of bottom, fish, baitfish and your lure, all illuminated on the highest resolution display available in a commercial grade flasher. 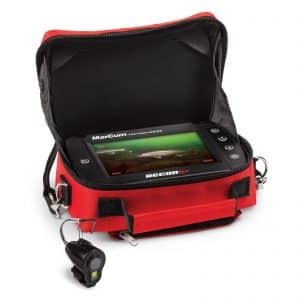 With advanced features like split screen zoom, patented interference rejection and 1000 watts of expertly managed output power you’ll always know if you’re angling for a school of bait fish or the “catch of the day”. 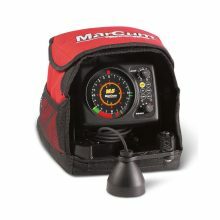 Each combo includes Sonar System, Lithium Shuttle, Charger, User Manual and 5-gallon Transit Bucket. Years in the making, this classic design has been improved even more by ice fishing legend Dave Genz. Dave has made his Blue Box” nearly indestructible so it will last for years of hard use. Genz redesigned the battery storage compartment and added a universal transducer holder system. 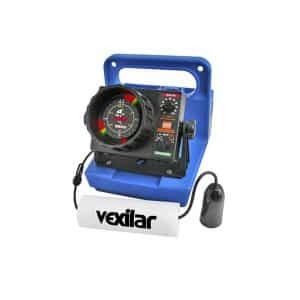 The Blue Box can also accept the full line of Vexilar accessories like a Battery Status Indictor, Vexilar Flex Light or even a Dual Beam Ice-Ducer transducer. The Blue Box fits on top of a five gallon bucket for easy access and handling while fishing. 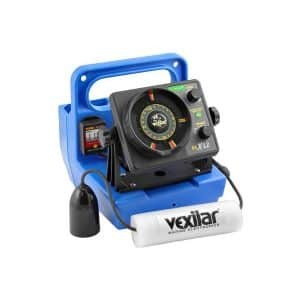 Available with the Vexilar FL-18 or FL-8se. Each Genz Pack Combo comes with a 12 volt, 7 amp-hour battery with charger and an Ice-Ducer transducer. The Genz Pack comes completely assembled and ready to fish with. It also includes an instructional video. This classic FL-8se flasher is truly legendary. The worlds most popular three-color sonar flasher, the FL-8se is still one of the best all-around flasher/sonar designs. The hallmark three-color display shows weak targets in green, medium strength targets in orange and strong bottom targets in red. 525 segments of resolution, super bright LEDs and 10 interference rejection settings make the FL-8se a great year-round flasher/fish finder. Pre-drilled holes for optional accessories. Easy access semi-enclosed battery compartment. Built-in transducer holder fits all sizes of Ice-Ducers. Specially designed base fits on top of a five gallon bucket. Pre-tapped transducer support eye-bolt hole. The Genz pack carry case, when rigged with a FLX-12 flasher and tricked out with the DD-100 to give you digital depth readouts, will get you ready for the ice. The classic Blue Genz pack case was designed by Mr. Ice fishing himself, Dave Genz. Genz loves this case because it is tough and easily adapted to other upgrades. 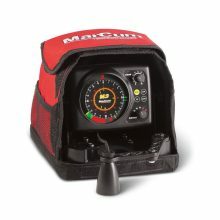 Comes standard with a 12 volt- 9 Amp hour battery and fully automatic digital charger. 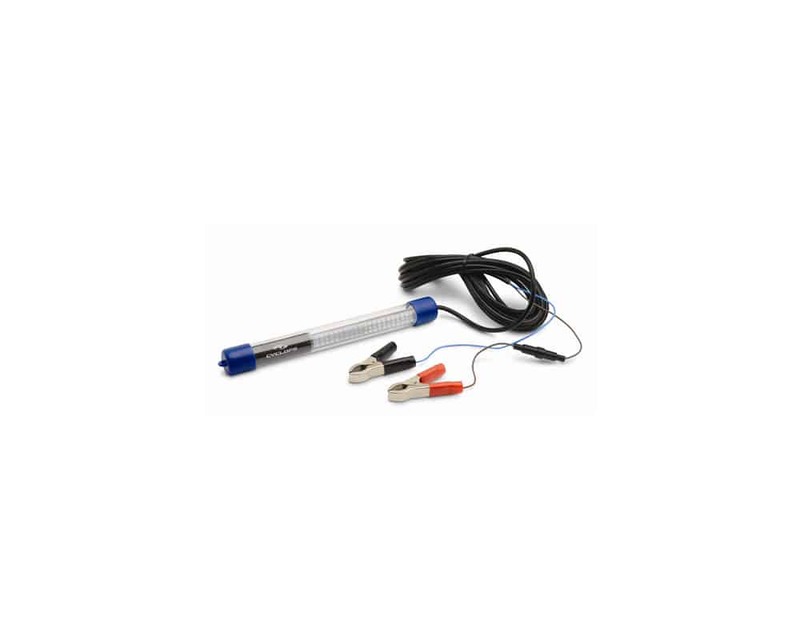 The Genz Pack with the FLX12 comes standard with a 12 degree IceDucer transducer. – This unit is a step-upfrom the Classic FL-8se unit. 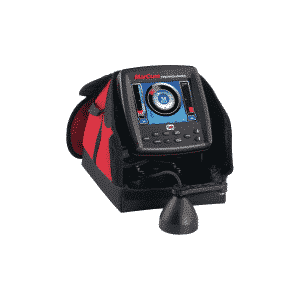 The FLX-12 offers a flat-screen display, but now with Vexilar’s exclusive brushless data transfer technology. The new LEDs deliver a 20% brighter and sharper display. 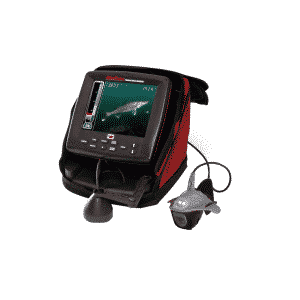 This unit has a special low power mode option that allows you to fish in extremely shallow water with great target resolution. 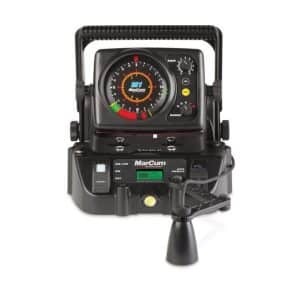 Five depth ranges to 120 feet. It offers a unique night mode option so the display is easier to view at night and also lights up the center depth graphics. There are 20 steps of Interference rejection (IR) to help knock-out interference from other sonar systems. If your battery is running low, the display gives a coded series of flashes long before the unit shuts down. The FLX-12 is VERY popular for open water use as well.